A medium duty TPR Ducting this is a Santoprene Flexible Ducting made from Thermoplastic Rubber. A very flexible exhaust extraction and air intake hose which has good resistance to chemicals and oils and is suitable for under bonnet applications. 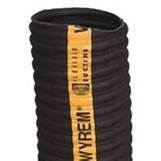 Can handle temperatures up to 130 Deg C.
Wyrem Hose is a 2-ply canvas heavy duty flexible ducting well known for its robustness in harsh environments and is ideal for handling hot and cold air, dust, fumes, wood chips & shavings and most other abrasive materials. 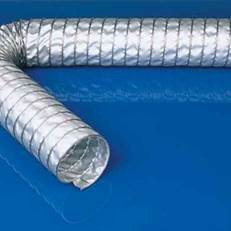 Aliflex is a flexible Aluminium Ducting for use as a general HVAC ducting for light duty fume extraction, heating and ventilation. 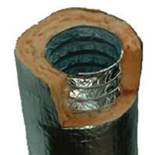 Aliflex K is an Insulated Aluminium ducting for light duty fume extraction and ventilation. Available in 10 metre lengths. High temperature hose for exhaust fume extraction in vehicle test beds and other applications where a high temperature ducting is required. Suitable for temperatures to 650 Deg c.